The MUSEUM HOUSE has 1600+ sqft on 3 stories. The entrance level features a large living area with walls of artwork, a wood burning fireplace, high ceilings, comfortable leather furnishings, a flat screen TV and 1/2 bath. The adjoining dining area has a glass table with 4 chairs and a small bar-area with 2 bar stools looking into the kitchen, a gourmet equipped kitchen with Cuisinart microwave/oven, Jenn-Air stove and dishwasher. Can't find something for your cooking needs? Just call me and I will get it to you. On this floor you also find an office area with desk in case you have some work to do. The Museum House has free WIFI, an IPOD docking station with speakers and cable TV. The open upstairs overlooks the living/dinning area and features a comfortable full-size bed and a 1/2 bath. Downstairs is the master bedroom with a stunning king size VERSACE bed and dresser with a 'Simmons Beauty Rest' mattress which has a 3 inch topper and premium linens. The bathroom has a large round Jacuzzi bathtub (enjoy!) and a separate shower. The backyard is open for our guest from 1 pm to 5 pm by request each day. Here you can enjoy the huge pool, relax on the lounge chairs and soak up in the hot tub. The Museum House is light and bright with high ceilings and blinds on windows for privacy. 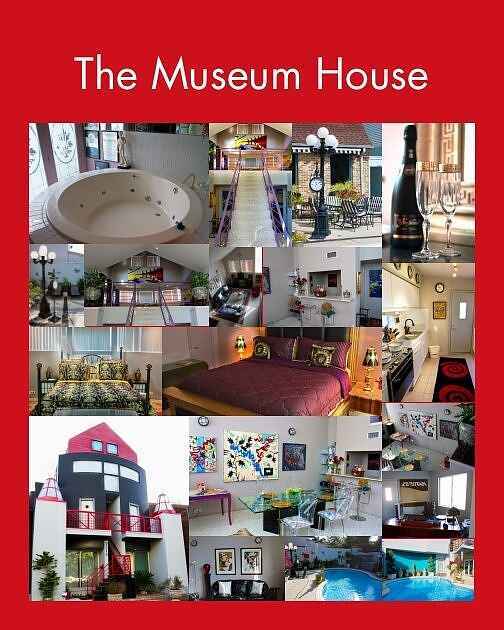 Located in an exclusive area, the Museum House has a private entrance, 3 stories with 2 small balconies in an unbelievable location, location, location! Stunning Townhome in Museum Dist., near Montrose and Medical Center! Luxury Living - Couples Special! Miller outdoor theater with summer performances (I'll tell you how to get free tickets, or just take a blanked, a bottle of wine, some cheese and enjoy the performance on the hill). all in about a few feet to 1 mile radius and in easy walking distance - leave your car parked at the Museum House and enjoy what Houston has to offer on foot. Coming for Downtown business or a Convention? Downtown and the George R. Brown Convention Center is just a short 3 miles away and you can take the Light Rail (in walking distance) to several Downtown Stations. It's nice not to have parking hassle in Downtown! The Engery Corridor is only a short Freeway drive away. Want to enjoy Houston's Performing Arts? The Theater District, including the Wortham Center for Opera and Ballet, Jones Hall for our famous Symphony, Alley Theater, Hobby Theater for the Performing Arts and Music Hall for Musicals - all located in Downtown and about 3 miles from the Museum House. Want to see your sports team? all stadiums are less than 4 miles from the house and most can be reached via light rail which is walking distance. Are you coming for Medical treatment or visiting a patient? M.D. Anderson , St. Lukes, Memorial, Texas Heart institute, Texas Children Hospital and the Medical Center are all just 2 miles away and can be easily reached with light rail (only 3 stations). So, leave your car at the Museum House and don't worry about finding a spot in the labyrinth of parking garages in the Medical Center. It takes you only a short 6 mile drive to the world famous Galleria and the Houston Design Center. We also have plenty of outlet stores which are a few miles away along the Freeways. In less than an hour you are in Galveston and ready to enjoy this charming Seaport. How far is it from the Airport? Memorial Park, Greenway Plaza, Uptown Park, Montrose Area restaurants and bars. If you arrive late, I am happy to get the groceries you need and I just leave the receipt with you.. The Museum House is in a very quiet residential setting and away from traffic in the most perfect location you can find. I am German and live in Houston for over 30 years. I love it in Houston and would not move to any other place. I live next door to the Museum House which makes it really easy to contact me if have any questions or need anything. I can help you make your trip the most enjoyable one you ever had. This property was designed buy an architect from South Africa and has won many architectural prices and awards. Contemporary in design and very functional, yet cozy and relaxing. I can not stress more the location of the Museum House. It's central to most everything in a diversified neighborhood. It's contemporary but yet cozy and you will enjoy the feeling of the open space. I personally will make sure that you enjoy your stay at the Museum House!